Now that the cold weather is setting in, it’s time to make sure the garage is ready for winter if you haven’t already done so. There are ways we can make sure we’re not trying do minor repairs to our garage during the coldest days of winter. It’s time to run through this handy checklist to make sure the garage is ready. With a professional garage renovation, several of these items will likely have been addressed. If you’ve not had a garage storage solution and garage floor installed then a garage renovation specialist would address them for you so you could easily prepare your garage for winter. If it’s too late in the season, here’s what you can do to start addressing them today. Water is always the most challenging issue for any home. In the garage where it is cooler than the home, water pipes are much more exposed. They can run into issues during a colder winter where water might freeze and burst the pipes. Use some simple pipe insulation to make sure any exposed pipes are given a little extra protection from the elements. If you have an exterior faucet inside the garage to water your front lawn, assure you have an inside valve to switch off water to this faucet. Protecting your water pipes means that you can avoid costly repairs to the home when spring finally arrives. The garage floor is one of the coldest elements of the home. The garage collects water and salt which can be quite damaging for any of our garden tools, kids toys, sports equipment and much more. 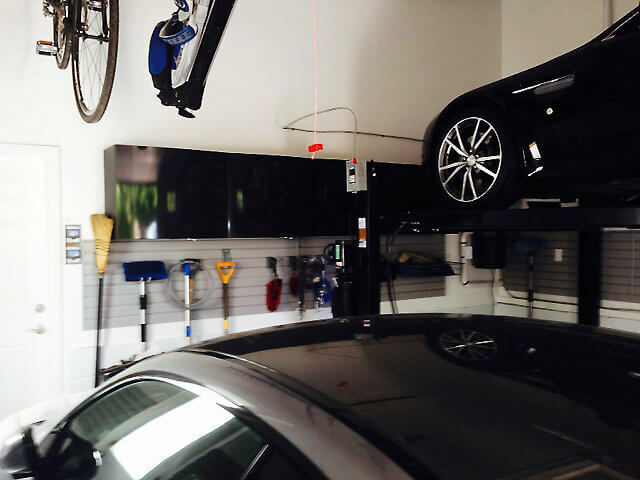 In a professional garage renovation, creating dedicated spaces to store family stuff on shelves, platforms, slatwall storage systems and in the overhead garage space means that everything will have a place. Designing a way to have winter tools such as shovels, salt and snow blowers conveniently located during the winter months while storing away garden tools such as rakes, hoses, spades and lawn mowers and vice versa for summer are the keys to a professional garage storage system. In the meantime, if it’s too late to get a garage storage renovation completed, there are a couple of ways to keep these belongs dry and free of salt damage. One way to do this is by installing some Swisstrax Ribtrax garage floor tiles. This will lift your belongings just enough so that water and salt will flow below the garage floor tiles instead of damaging household tools, kids bikes and toys or sports equipment. Or, a few bricks and a couple of pieces of plywood will be enough to keep your belongings off the floor for this coming winter. Starting late February or early March, contact a garage renovation specialist to start a discussion to plan and develop a garage renovation project that your whole family will appreciate. Many people still have concrete garage floors. As we’ve discussed in a recent garage floor blog, there are many ways in which concrete floors can be damaged by the winter weather. The main culprits are water and salt dragged into the garage by the vehicles we drive and the small boots walking into the home via the garage. If you’ve got the time before the cold weather sets in to make repairs to the pitting or cracks in the concrete floor, the local big box stores will have some DIY solutions. The best solution for a garage floor is a polyaspartic garage floor coating. A garage renovation specialist will also prepare the concrete beforehand to make sure that your floor coating adheres properly instead of bubbling or lifting after one or a few years. Of course, the Swisstrax Ribtrax garage tiles is a DIY install that you can complete any time so that you can improve the garage floor. Keep the garage warmer. It will be more pleasant when taking the garbage or recycle out to the garage or when someone needs to dig out seasonal decorations or when airing out hockey equipment. The drafts from windows or a poorly sealed garage door will cause the garage to becoming cooler than it needs to be. Replacing the seals around windows and along the edges of the garage door will mean that your family will be more willing to make those quick visits to the garage to do chores or put their sports equipment away where they belong. And,it will protect many of your family belongings from premature wear and tear. Finally, make sure your garage door is ready for the winter. Lubricate the moving parts,check to make sure the cables do not require replacement, tighten up loose hardware, inspect and replace the rollers for the door and make sure the door balance hasn’t shifted with the seasons. If you find some or all of this daunting, you can easily contact your local garage door installer to help you do regular checkups and maintenance. It’s a good idea to make sure these annoying issues don’t crop up during the coldest days of the year. Having a well-designed and well maintained garage means that it will protect your family, your vehicles, your home and the many belongings we store in the garage from the damage of cold, water and salt of the typical winter season. If you’re having a difficult time parking your vehicle in the garage, it may be time to get a garage renovation which will assure you can store your belongings safely in the garage while also being able to park each of your vehicles inside safely as well. If this is a challenge for your family today, plan to speak to a garage renovation specialist in the early spring so you can design your garage to meet your family lifestyle needs all year long.